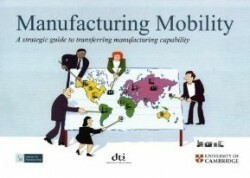 Provides a guide to the total process of moving manufacturing capability to a new location. Senior managers who have strategic responsibility for the transfer of production technology will find the structured approach to planning a transfer invaluable in order to avoid the many pitfalls associated with such projects. The workbook describes the total transfer process from its initial conception as part of the business strategy right through to the point when the transferred technology is operating successfully in its new location. It provides a framework by which to link strategic considerations (eg Which country are you transferring to? What process is being transferred?) with implementation activities (eg What equipment needs to be transferred? How much training of the local workforce is required?) allowing potential problems to be identified early in the planning stages as well as various different scenarios to be considered.